How many times in the last week have you lain awake at night worrying about how well your organization was executing your strategy? Survey after survey would say you’re right to be worried. 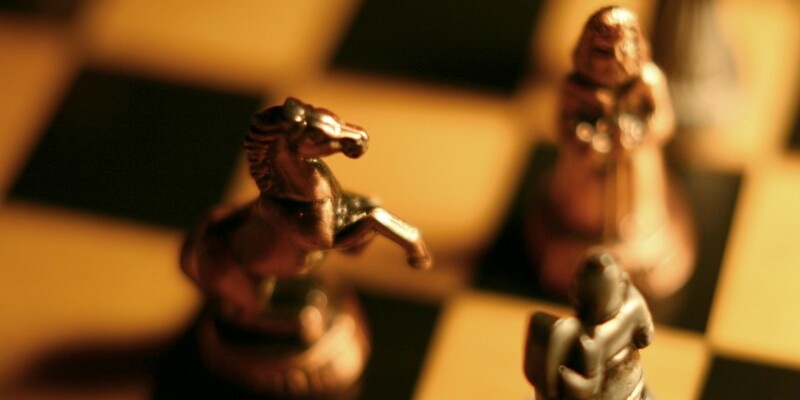 Most organizations simply can’t come close to delivering on their strategy’s potential value – sometimes missing by as much as 50% – so why should yours be any different? clear accountability for progress towards achieving those goals. You already know that, though. The problem is actually making it happen. In their book “Execution”, Bossidy and Charan summarize the above points as being able to systematically expose reality in order to act. Unfortunately, reality is so…messy. That’s what truly makes execution so hard—well, that, and it takes a hell of a lot longer to actually implement a plan than it takes to draw it up. We also have lots of literature, frameworks and toolkits that are generally considered useful and helpful, yet if it was as easy as pulling a few off the shelf, filling in the blanks and rolling them out to the organization, the size of the Strategy Gap wouldn’t be between 40-50%, and execution and strategy implementation concerns wouldn’t consistently be in the top 5 issues reported by The Conference Board’s Annual CEO Challenge. We spend all our time and effort chasing symptom after symptom, spending millions each year on internal and externally-led change initiatives, and yet we still feel like we’re in an organizational version of Whac-A-Mole, invariably seeing those same issues we thought we’d addressed popping up again when we least expect. There must be something missing. If we already know the answers and, in theory, we have all the tools we need for successful strategy execution, then maybe it might be better to investigate how we feel about execution rather than re-hash the theory we already know. Have you felt all those? I know I have, and I’m pretty sure anyone who’s been in charge of an organization – from start-up to blue chip – has too. The only difference may be the frequency of the headaches and the size of the ulcers. We also know that the ideal situation isn’t about “standing over people’s shoulder” types of control. It’s about knowing that when you turn your back, everyone knows what to do, how important it is and, more importantly, what not to do, to keep things on track and end up implementing a market-winning strategy. Finally, we know that ultimately, the common theme causing all the above frustration and stress is uncertainty. We want to either a) know we’re on course, or b) get as much warning as possible we’re on the right track so we can actually do something about it. Our regular readers know where this is going already: it’s about dealing with uncertain outcomes, and that means dealing with risk—not just with ourselves, but across the entirety of our organizations. What keeps us awake and gives us ulcers is the uncertainty of whether we – our entire organization – can successfully implement our strategy. First, we need a way to ensure that each element of our overall strategy is expressed in a way that’s both meaningful across the organization and can be expressed in a relevant way within each business unit, functional area, project team and to each individual employee. Don’t laugh. I know you’ve heard this before, but it really is possible. You just need to think about the problem a little differently than you have in the past. If we do this properly, it is the foundation of systematically saying goodbye to our sleepless nights, because everything else on Kapta’s list can be addressed as a function of focusing on this one problem. 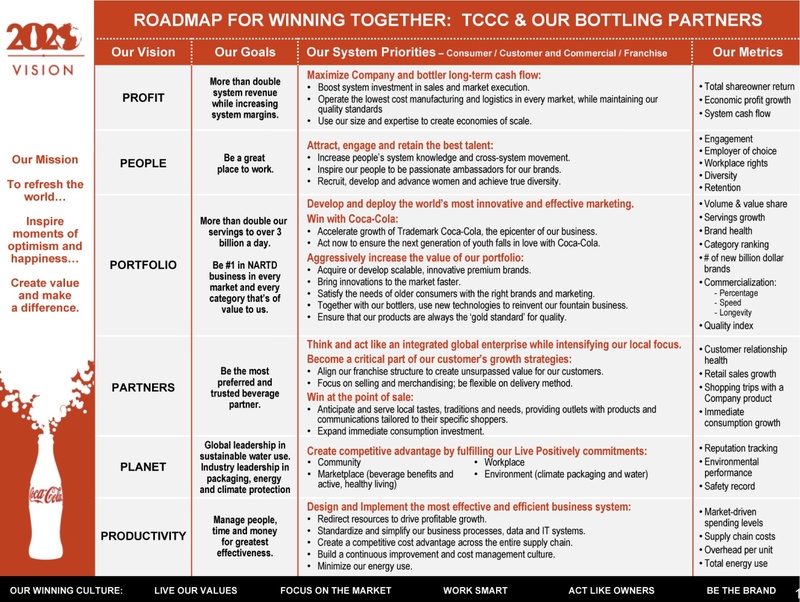 Let’s take an example from Coca-Cola’s 2020 Vision strategy, initiated in 2009. 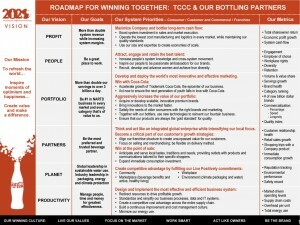 They’ve identified 6 key areas of focus, and within each one they have defined specific goals, priorities and metrics. We’ll look at two of them: Profit and Productivity. My guess is that Mr. Kent has had his share of sleepless nights as well. Maybe he has some of the same frustrations and uncertainties that we do. How Do We Get More Sleep? As we’ve said before, if you want to reduce your stress levels and get a handle on the uncertainties in your environment, you need to ensure you’re appropriately managing your risks. Once you’ve done this, you’re going to feel safe and confident enough to do whatever else needs to be done to deliver your winning strategy. Let’s see what we might do if we were in Mr. Kent’s shoes. First, a little Coca-Cola 101. Mr. Muhtar Kent is the Chairman of the Board and the CEO, and he has a Senior Operations Leadership team consisting of the Presidents of Coca-Cola’s North America and International divisions and the President of the Bottling Investments Group who is responsible for all company-owned or consolidated bottling operations except for North America. In total, the complete Senior Leadership Team consists of 14 people, plus Mr. Kent. Now, let’s go through our “worry list” from above and see what we might be able to do about it in concrete, practical terms (just not in the same order). Our primary concerns here are that everyone on our team performs well and they are fully on-board and aligned with our overall strategic plan. Once we know they’re on-board, we also need to ensure that we agree on the priorities of each of our strategic objectives, not only in relation to specific areas, but also have the opportunity to debate and decide as a team what is most important if trade-offs need to be made. To validate that everyone is clear on what needs to be accomplished, we need to know specifically what each member of our team intends to do in their own area of control (SBU or Function) to ensure we achieve our strategic objectives. We need confidence that not only does our team understand what we need to do as an organization, but we also need to know they can effectively articulate their own role within the bigger picture. If we’re Mr. Kent, what we want from each member of our executive team is one or more clear and concise statements describing what their own teams need to provide to ensure our overall strategic objectives are met. Collectively, these statements establish either the SBU or Functional level strategy that supports the overall business strategy. We can enable/deliver/ensure _________ by doing __________________. If we get statements expressed clearly enough, we can reduce our uncertainty that our team understands the strategy and have confidence that the actions they propose will indeed support our own understanding of the strategy. We’ll know they’re fully on-board, and we’ll get the opportunity to review and question the way they see their organization’s contributions towards implementing the strategy. Using those statements, we can then begin to identify which ones will have the biggest impact and which ones shouldn’t be pursued, even though they do support the specific strategic objective. Once the priorities have been agreed, then at each level of management within our team’s own area, we would expect a similar exercise to take place. If this is done, we can ensure that each level of management is directly aligned with the one above, and we can have greater confidence in our ability to influence the overall direction of the organization. Not only does it give us clear links from top to bottom of the organization, but it also allows us to go from any front-line employee and see exactly how what they’re doing contributes to implementing our top-level strategy. So far, we’re doing pretty well: 4 sources of stress in our lives addressed by the same activity, and we’ve ticked the first box on the list of the three essentials of successful execution. Let’s see what we can do about the other two. No wonder we’re losing sleep, chugging Maalox and find it difficult not to rip people’s heads off from time to time. If things are working correctly, this shouldn’t happen. We should know we’re headed for trouble before it’s too late to do anything about it. We need time to think and make informed decisions on the right way to respond to these changes for our customers, our people and our shareholders. For each of our team’s individual strategy enablement statements above, we need to be able to quantify progress in some way–even if we’re using qualitative measures. That means we need to agree – as an executive team – on the measures and frequency that will be monitoring our team’s progress on actually delivering what they proposed with their enablement statements. In case you’ve forgotten, the remaining two elements of successful execution were 2) regular measurement of progress towards those organizational goals, and 3) clear accountability for progress towards achieving those goals. If we have metrics proposed by each member of our team to correspond with each of their own suggested enablers, then we not only have addressed the remaining two fundamentals of successful strategy execution, we’ve also slam-dunked our “worry list” at the same time! Measurement and legitimate accountability—straight from the horse’s mouth, as it were. We’ve given priorities and a sense of purpose to everyone across all levels of the organization, because they understand what they have to do, and they know that what they’re being asked to do is important to everyone. Our employees “get it” now. We’ve established the parameters where people can be confident in taking the initiative, making the organization more nimble and adaptable as a whole while still staying on course. And…we just might sleep a little better at night. However, if you can’t, just give us a call or fill out the form below. We’ve helped many organizations just like yours, and we can help you too.